Ned Rozell | Geophysical Institute May 8, 2015. 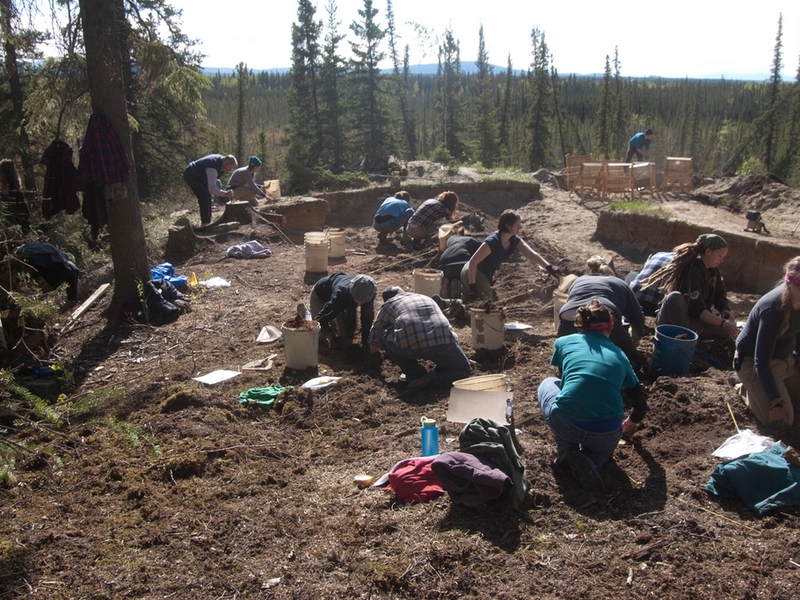 Students working at the Mead Site in Interior Alaska with archaeologist Chuck Holmes, who is at far left. During the last two summers, teams led by UAF’s Ben Potter have expanded the breadth of the Mead Site, a white spruce bench that overlooks Shaw Creek Flats north of Delta Junction. Within the boundaries of the Mead Site, researchers have found what they believe are tent outlines. Inside the oval of what was probably a hide-covered structure 12,300 years ago, a student working with a trowel found a tiny bone pendant with delicate crosshatching on the edge. “Were these toggles or buttons for clothing?” he said. Interior Alaska is a good place to find artifacts because of strong glacial winds that for thousands of years covered people’s campsites with loess, fine dust that flows out of glaciers. Loess has sealed off bone and other material that would rot if exposed to acid-rich boreal forest soils. The flour-like dirt has created nice layers that show scientists the people have used the same great spots again and again.